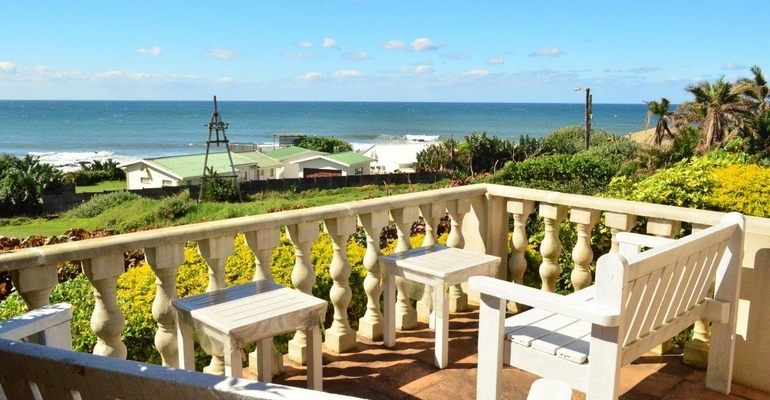 Ocean's Paradise is a holiday cottage that has it all. We have 3 comfortable bedrooms with 2 bathrooms that sleep 6 people, with pets very welcome! We have all the modern amenities set up in our quaint beach house, with a great sea view and local beaches on our doorstep. Directly in front of us there is a great fishing spot, with a tidal pool and lots of rocks to explore for the kids, as well as a blue flag bathing beach only a 5 minute walk either side of us.Have a whale of a time watching the dolphins swim by, or enjoy a leisurely morning trying to identify ships as they sail past from our sun deck, with sea views that are unrivaled anywhere on our coastline. We are fully equipped for a relaxing holiday at the beach, we have 2 separate garages for secure parking on our alarmed and fully fenced property, with a great garden for the canines to enjoy! You can also relax inside with our OVHD satellite TV, or plug in your own DSTV decoder. ADSL internet is also available for all guests. A large kitchen will keep the domesticated happy and we do include a maid service to keep the accommodation clean and comfortable. Please remember to bring your own beach towels. - This is a non-smoking facility - We respectfully request that you only smoke outside - if you have to. There are also 2 superettes within close walking distance for the basics, along with a post office, a hair dresser, antique shops, a bottle store, and various pubs and restaurants. The proof is in the pudding, so please DO accept our invitation to share a little taste of our Ocean's Paradise with us.